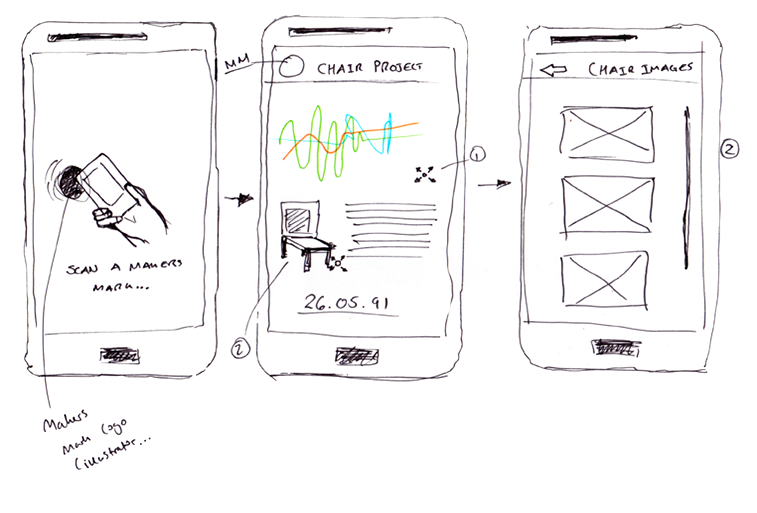 Working alongside a product designer, Living Memory is our answer to this brief. 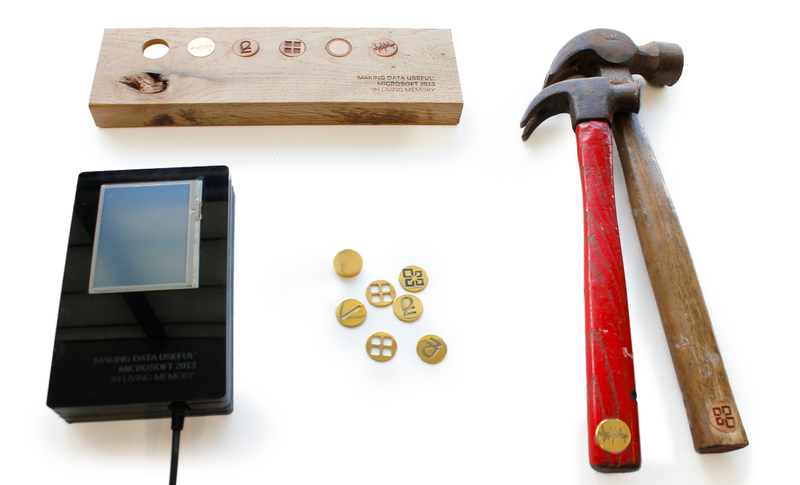 Through a mobile app, makers can leave their legacy in the objects that they create. Our project was ultimately hand-picked by Microsoft Research Liaisons and we were flown over to Redmond in the US to present our product alongside 8 other countries at the annual Microsoft Expo. We went through multiple rounds of brainstorming until we came to an idea that allowed us to bridge both our skillsets. Eventually we settled on the idea of ‘smart tools’ with embedded sensors that would record how they are used. Through sketching, I explored how users would retrieve this data on their phones and my partner explored how sensors might be physically manifested in the objects that the maker’s would create. The solution was that users could scan an RFID tag and receive data through the cloud to their phone. 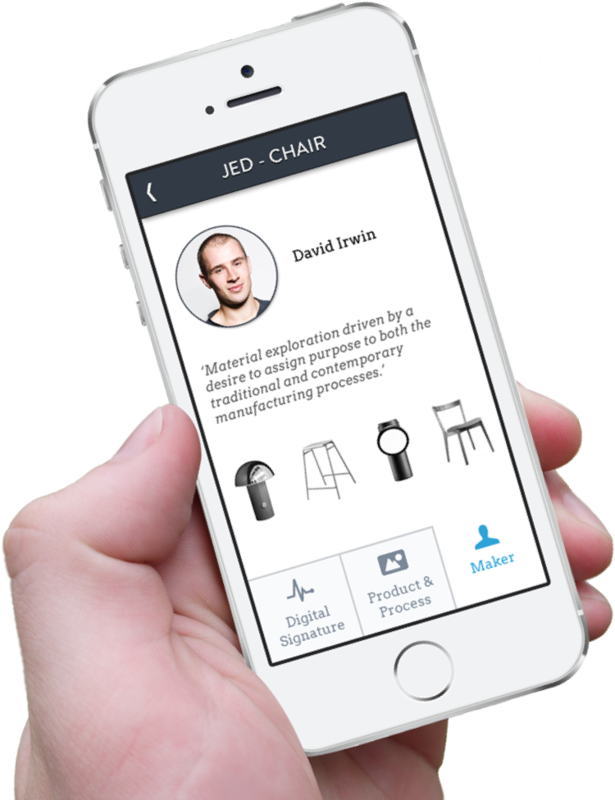 This would be data such as an item’s digital signature, repair tutorials and information on similar objects from the same maker. Hallmarks have begun to lose their value due to imitations stamped with the 'made in Britain' mark. We decided that these marks would be perfect for housing our RFID tags, bringing value and authenticity back to the mark and also allowing it to become a gateway to any imbued data. Whilst we eventually produced a mobile app, we also experimented heavily with physical prototyping tools such as Gadgeteer and Arduino throughout the project. This allowed us to do contextual research with maker’s and consumers at an early stage to test and validate our assumptions about what imbued data was useful. We were then able to discard ideas before wasting effort on high fidelity visual design. These prototypes also formed part of our final presentation at Redmond, showcasing our process and journey to the final solution. I worked up a high fidelity prototype that we tested with users and ultimately showcased in our Microsoft Expo presentation. The people that we tested with confirmed our assumptions that they would interact with Hallmarks through an object that they carry with them at all times. – their mobile phones. We presented at the Expo in July 2013, showcasing both the Gadgeteer work and our concept video. Bill Buxton was particularly interested in our project and it received a great amount of praise for facilitating an empathetic connection between those that make products and those that purchase them. - Increasingly we live in a day and age where cheap, mass produced goods are bought and thrown away with such ease. It was for this reason that the Microsoft Research staff that mentored us could easily see the value in highlighting the value of the ‘hand-made’.